When we last saw the Firefox 3 robot, he was triumphantly proclaiming victory in honor of the record-setting release last June. Since then, of course, the Mozilla development community has been hard at work modifying and improving Firefox 3 to get it ready for the upcoming 3.1 launch. So, in that same spirit we sent the robot back to the shop for some upgrades, too. The idea behind the upgrades was to give the robot a look that would be appropriate for the Shiretoko release, so we enlisted the help of talented mecha illustrator and colorist Josh Burcham. 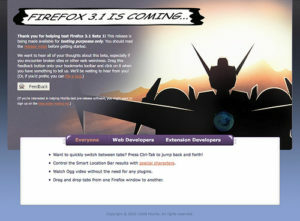 As you can see from this screenshot of the Firefox 3.1 beta 1 first run page, the robot is still lurking in the shadows, but don’t worry…more will be revealed soon. Did You Survive the Summit?